The Cheap Dead Sea Beach in Jordan. 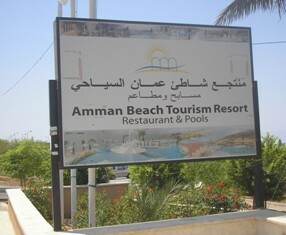 Amman Beach is your best option to enjoy the benefits of this unique mineral water without having to pay the crazy prizes for the 4 and 5 star Dead Sea hotels. You can find showers, restaurant, cafe and sweet water swimming pools above the seashore. Entrance fee is 10 JD. Cover yourself from head to toe in black Dead Sea mud and take that obligatory picture… (Yes, it IS a Kodak moment!) … to scare your loved ones back home. By the way, Dead Sea Cosmetics are one of the best souvenirs to take home from Jordan. My female friends and family members always appreciate them. Make sure you don’t have any injuries on your skin before you enter the water or spread the mud on yourself because the salt burns them like hell. Even without any scratches I can’t really stand it longer than 10-15 minutes, my skin just starts to feel itchy. Don’t let the water go in your eyes, too. If it happens, rinse them very well with freash water from the showers. In any case, take a thorough shower after floting in the Dead Sea and rub off all the mud. Don’t swallow the sea water, not only tastes uttery bitter, it can also make you retch.